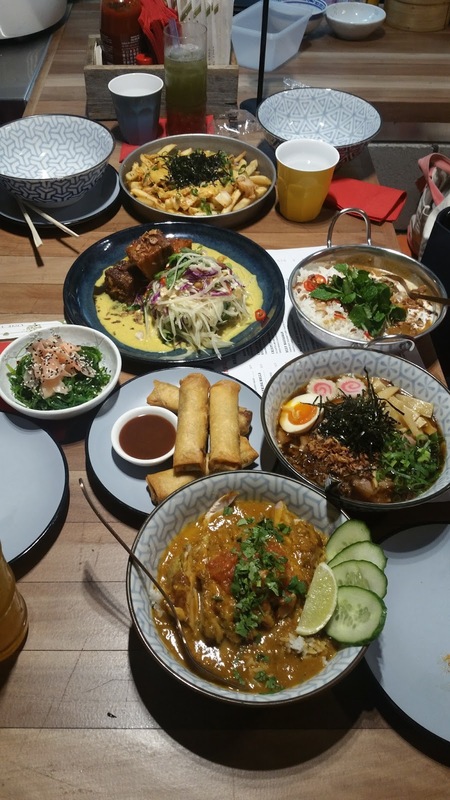 With winter fully having arrived, one way to keep warm is to enjoy some hot curry and other delectable dishes with good friends. 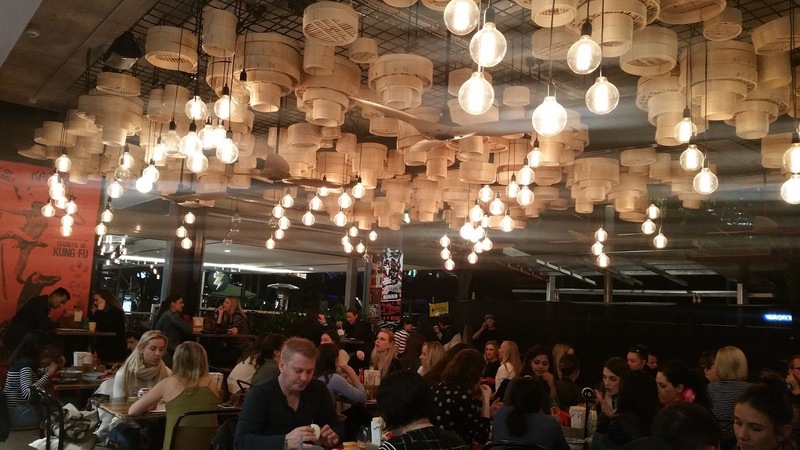 Which is why I was quite pleased to receive an invite to try out Junk at Southbank. Taking two girlfriends out for a long overdue catch up, it made for quite the night out. 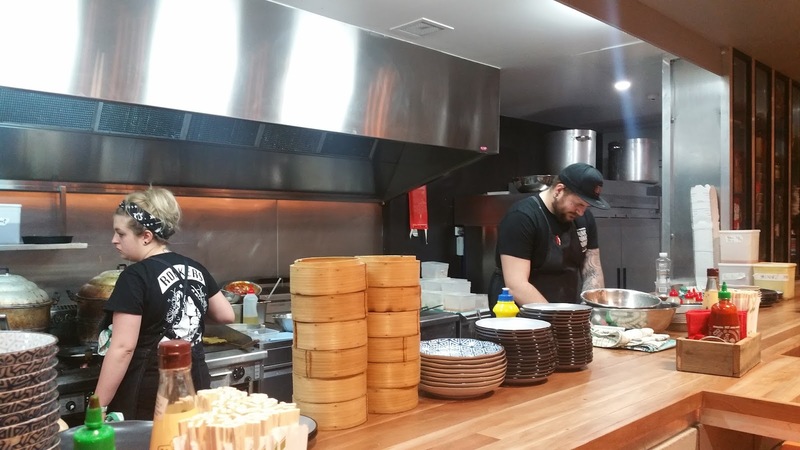 Having started their first shop in Maroochydore, it has gradually branched down to Toowoomba and only just opened their Southbank store earlier this year, and despite the construction outside which blocked the view of the main shopfront, it was close to a full house that night when we arrived, and there was a lineup when we left. We were soon seated upon arrival, and got an elevated booth right next to the kitchen, which gave us a spectacular view of the chefs in action. 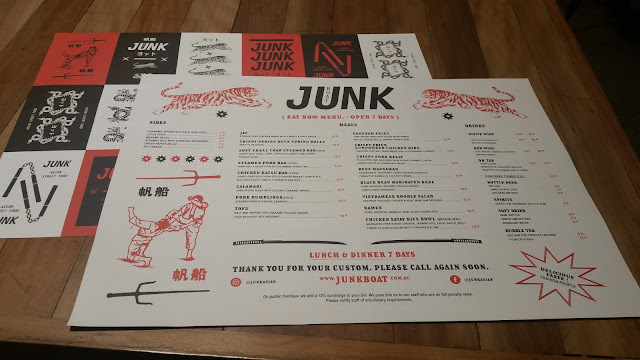 The menu doubled as a placemat, and I was intrigued to see a very wide variety of food, drawing inspiration from Korean, Japanese, Chinese, Vietnamese, Thai, and Malaysian cuisines. 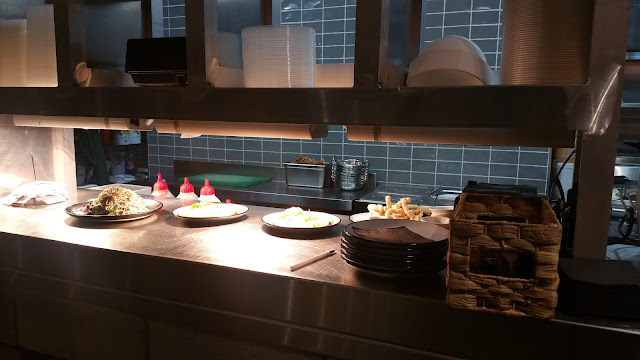 The menu was split into a section for sides, main meals and drinks. Desserts were noticeably absent. Making our selection, we placed our order at the counter, and were given a number. 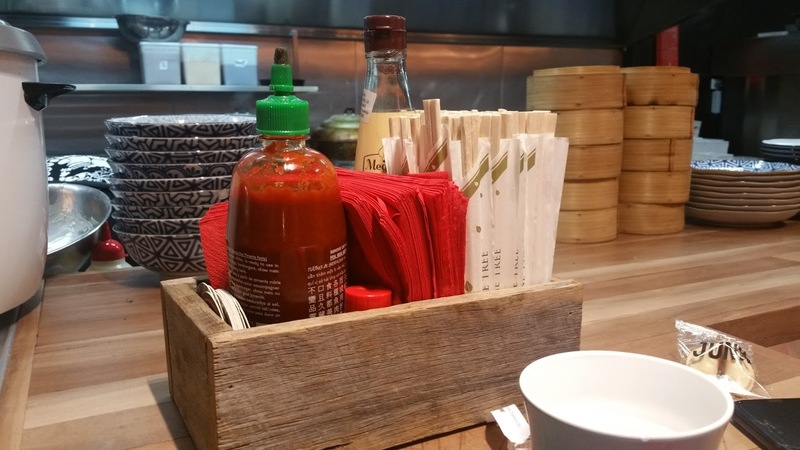 Cutlery in the form of chopsticks were provided at the table along with some sauces. Knives and forks can be obtained from the waitstaff where required. After ordering, we had a serious case of food envy as we checked out the other meals coming out behind us. I regretted not ordering the Roti immediately. Our drinks arrived very quickly. We ordered the two bubble tea of the day, one was a green apple and pomegranate tea and the other was a peach and mango tea. I tasted both, and really enjoyed the refreshing fruity tastes that were not overwhelmed by sweetness. I particularly enjoyed the popping bubbles which were quite new to me, and contained a pomegranate and mango juice, creating a delicious fusion of flavours. Our food envy didn't last long, as our food came extremely quickly very soon after ordering. The spread was very impressive, and we almost didn't have enough space for everything. 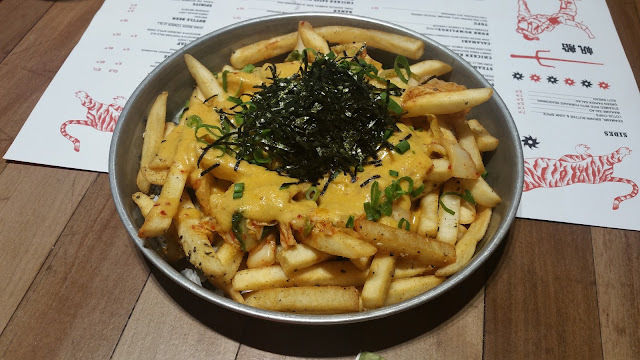 Our first dish of the evening, which we were super excited to try was the Gangnam Fries, which were spiced chips with house made kimchi, nacho cheese sauce, spring onion and nori. The plate was quite big and we were impressed with the size. We really enjoyed the lightly spicy kimchi which created an interesting combination. The nacho cheese coupled with fries reminded me quite a bit of mexican food, whilst the kimchi reminded me firmly of its Korean elements. 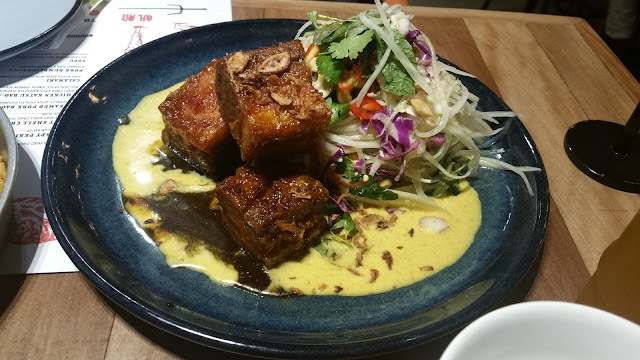 Next up was the dish everyone was waiting for, the Crispy Pork Belly cooked with Kaffir Lime and Dark Palm Sugar Caramel served with a Laksa sauce, with a side of Green Papaya and Cashew Nut Salad. 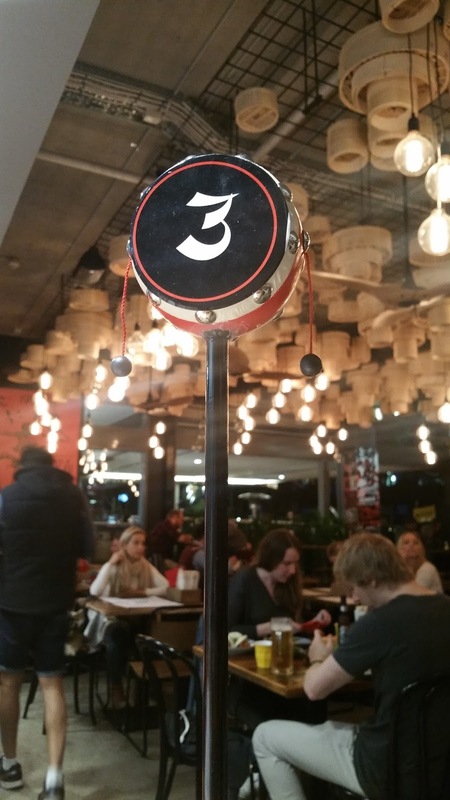 The dish came with three pieces, which was just right for the three of us. 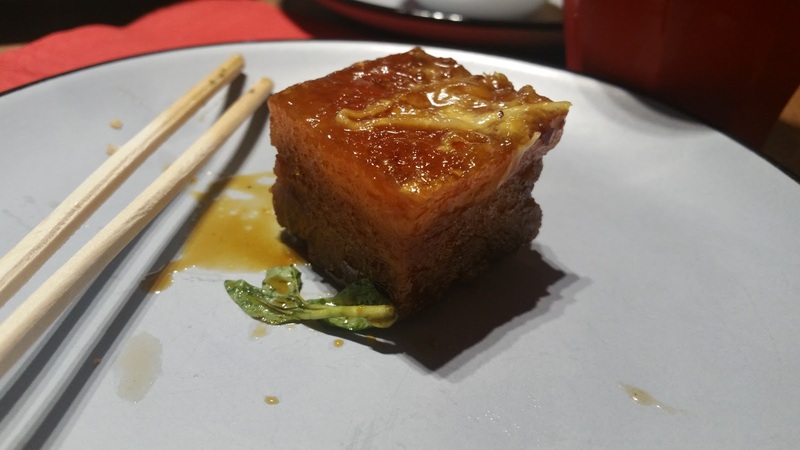 Despite there only being enough for one piece each, the cube of pork belly I got was quite impressive in size. Although the belly wasn't too crispy that evening, the skin was deeply infused with a lime and caramel flavour. 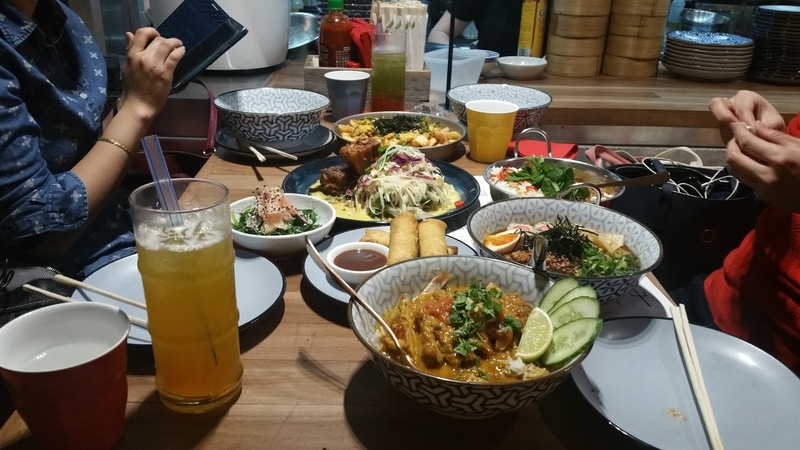 The laksa added a little bit of spice, whilst the papaya salad kept it refreshing and well balanced. 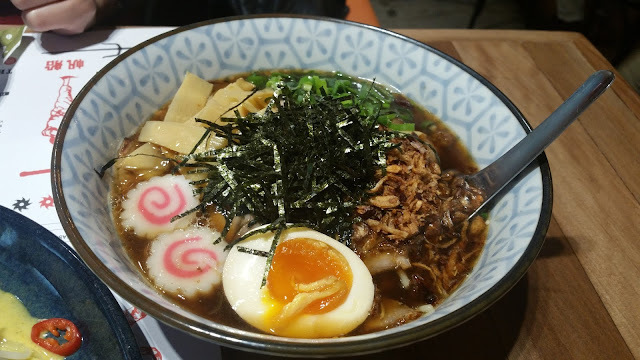 On the Japanese side of things, we shared a bowl of Pork Ramen, which came with curly egg noodles, bamboo, nori, naruto and a slow cooked egg. The broth was relatively clear compared to the ones you would get at Taros or Hakataya, leaning towards a more Tokyo style ramen. I really enjoyed the slow cooked egg which retained a deliciously gooey centre. The ramen had a strong egg tones to it, which matched the nori and bamboo well. Another dish we shared was the Crispy Peking Duck Spring Rolls with a side of plum sauce. One of my companions loved this, and it wasn't hard to see why. 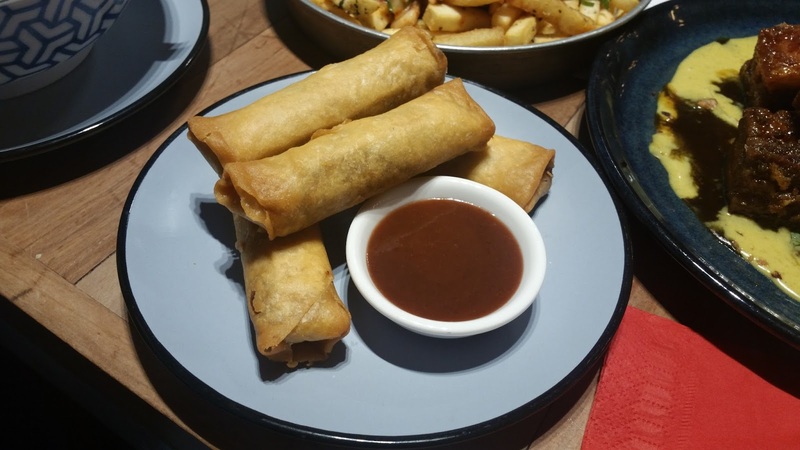 The spring rolls were piping hot from being freshly fried, and filled from top to bottom with peking duck, and mixed with hoisin sauce. We had to cool it down with some of the plum sauce, which my companions enjoyed, but I found a little too sweet. Two other dishes we had that night were the Salt and Pepper Tofu, swerved with wakame salad, yuzu avocado sauce and soy dressing. As a big fan of wakame, we also got a side portion to share as well. For me, this was the highlight of the meal. 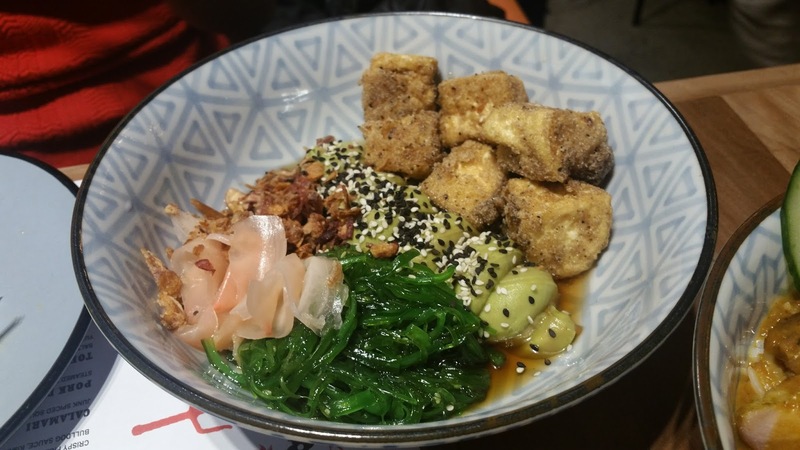 I loved the fresh tofu with its crispy exterior and soft silky interior, it really hit the spot. What made this dish so special to me though, was the avocado yuzu sauce on the side, which struck a good balance of being both light and creamy at the same time. 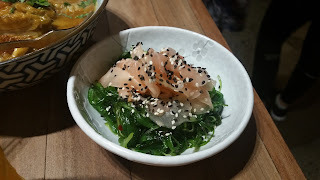 The side of Wakame salad was served with a topping of ginger, and both black and white sesame. I found it to be quite tangy and delicious. 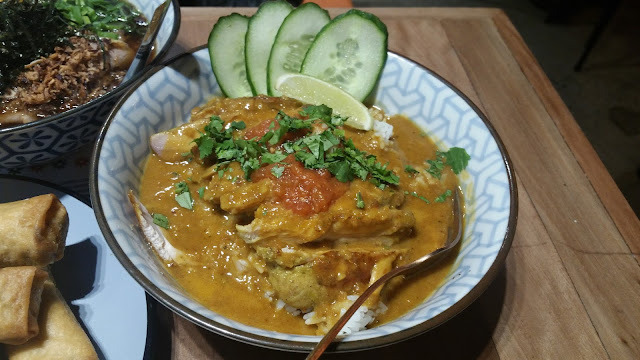 That night we had two rice dishes, the first dish was the Satay Chicken with spicy tomato, garlic relish, coriander and lime. It was quite spicy, which helped warm me up. The jasmine rice was surprisingly fragrant, and coupled with the coriander, it gave my senses quite a strong hit. The chicken was ample and the sweet peanuty satay sauce was also generous to be more than enough to accompany the rice. Our last dish was the Beef Massaman, with toasted peanuts, pineapple sambal and coconut cream. 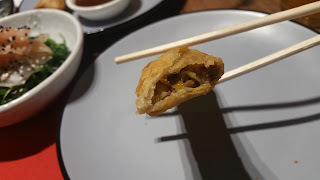 Expecting it to be quite spicy, it was on a similar level to the satay chicken. 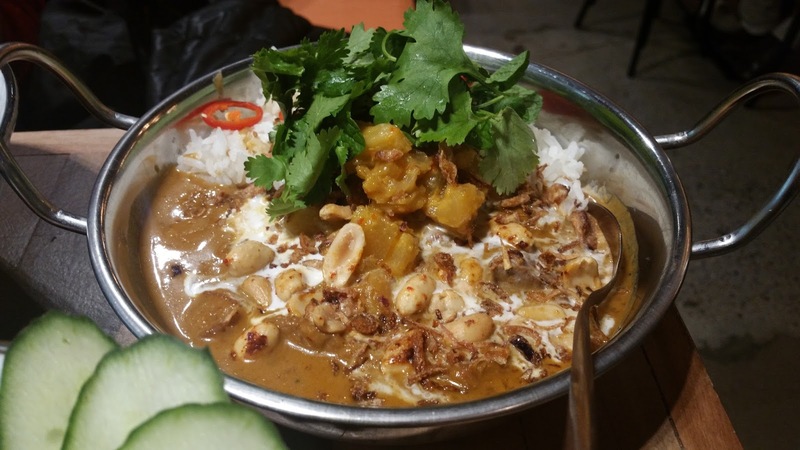 The coconut cream permeated the rice, making it creamy and sweet smelling. The beef was very tender and melted in my mouth. Whilst there were no desserts on the menu, we rounded off our meal with some crunchy fortune cookies. 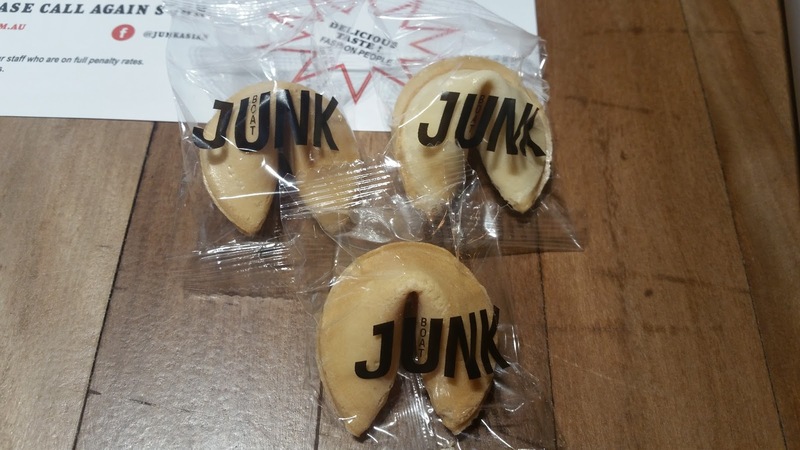 Having not eaten one for years now it was quite nostalgic and a fitting way to finish the meal. 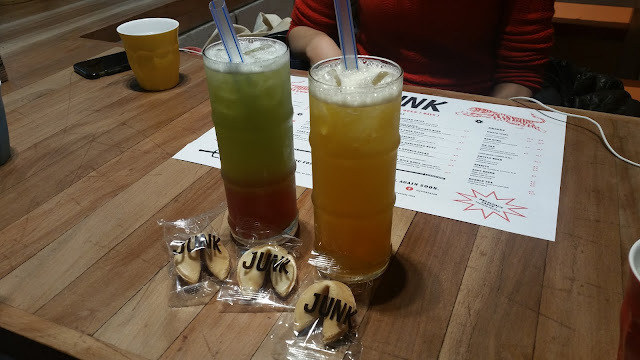 Espresso & Matcha were invited guests of Junk, but all as always, our opinions remain solely our own.